Are you looking for a software application that can give you a lot of control over converting or transcoding your videos to a different format? Well, here is a free solution for you which is a powerful open source video transcoding software called Handbrake. Not many have heard about this amazing tool, but it offers a plethora of formats and presets for different devices for even a beginner to start working with it. There are plenty of features that Handbrake offers which are described below. This is a pretty useful feature when you want to transcode a number of video files into different formats. You can add all those video files to a queue and start the queue. All the videos in the queue will be transcoded according to the settings and presets that you have selected for each video file. 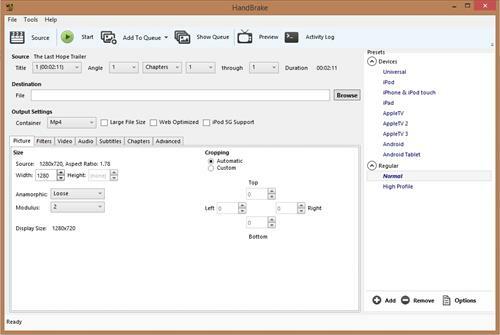 One of the major pros of Handbrake is that it is open source and free for download. It gives advanced control to users when converting videos like setting the width, height, codec, framerate, etc. according to the user. Handbrake can also process BluRays. It offers presets for Android and iOS which makes it easier for the user to set the settings according to the device which he/she has. Handbrake can be challenging for a beginner to use because all the advanced settings can confuse the user. The Graphical User Interface is not so easy. To conclude, Handbrake is a powerful tool that you can get for free. It gives complete control to the user in converting the videos. So, the beginners might struggle with it initially. But, it is a great alternative for paid software applications that do the same job. So, as it is a free application why not just try it out by downloading it from their official website? I have been using it on my PC for minimising the size of bigger videos I shoot on my digital camera or smartphone. Though I have not yet used it to transcode the video into any other format, this article has aroused my interest to try it. Thanks.